Following his aunt’s footsteps and getting into tennis was a great fit for A.J. Antoneli. His aunt was the perfect person to teach him how to play with her background. She played in college and now is a professional instructor. Antonelli first got into the sport when he was in middle school, but stopped because he didn’t enjoy it. 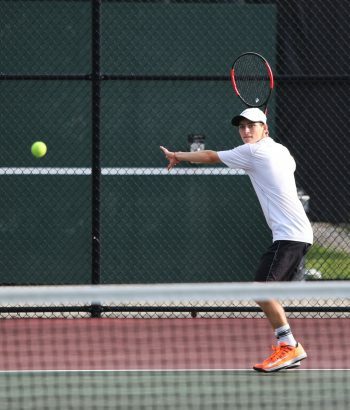 Deciding to give it another shot in eighth grade, Antonelli fell in love with tennis. He had to learn how to manage his schedule though, because at the time he was playing Baseball as well. After his sophomore year, he decided he should focus fully on Tennis and stop playing Baseball. Although this was a tough choice, he thought it was the right one for him. Antonelli helped lead the Kingsmen to Northern Indiana Conference and Sectional Championships this season. He gutted out a nearly four-hour victory at No. 1 Singles against Marian’s Cameron Rafinski in the Sectional Championship. Antonelli would like to continuing playing in college and has a few schools he is interested in, but as of now he is undecided on where he wants to go.